Eastern Chad has a recent history of extreme violence, in addition to the Janjaweed attacks, the area is threatened by rebel groups fighting Chadian and Sudanese armies on Chadian territory. 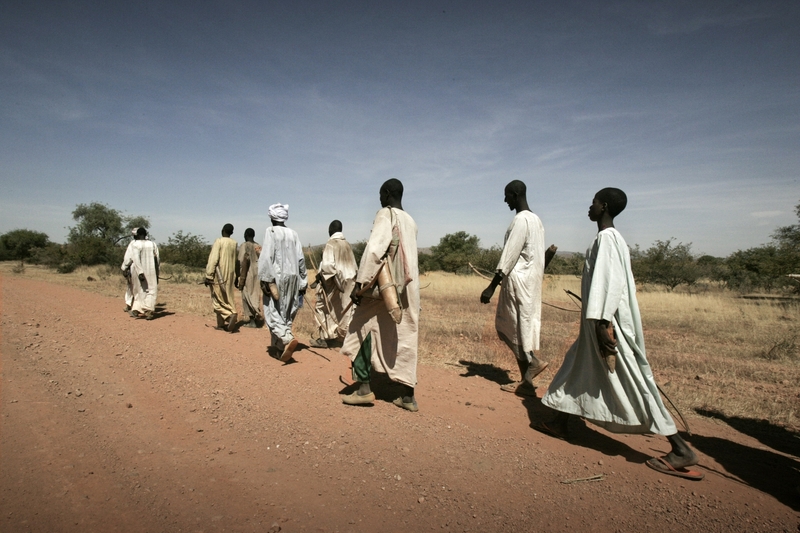 Since 2004 over 260,000 Sudanese refugees from Darfur crossed into eastern Chad. They live in 12 camps along the border. Over 85 per cent of them are women and children. The latest influx of refugees arrived after an attack on three villages in western Sudan in February 2008. 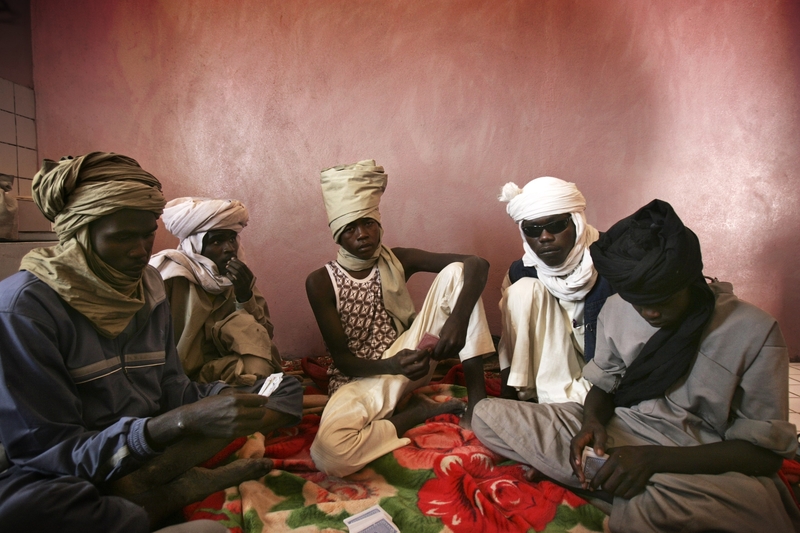 Since April 2006 regular rebel attacks on Chadian villages in the border area of Darfur, have led to a spiral of escalating violence throughout eastern Chad. About 170,000 Chadians have been forced over the last three years to flee their villages, often leaving all their belongings behind. In January 2009 over 15,000 refugees from Central African Republic (CAR) have entered south-eastern Chad, following clashes between Rounga rebels and the national army of CAR. 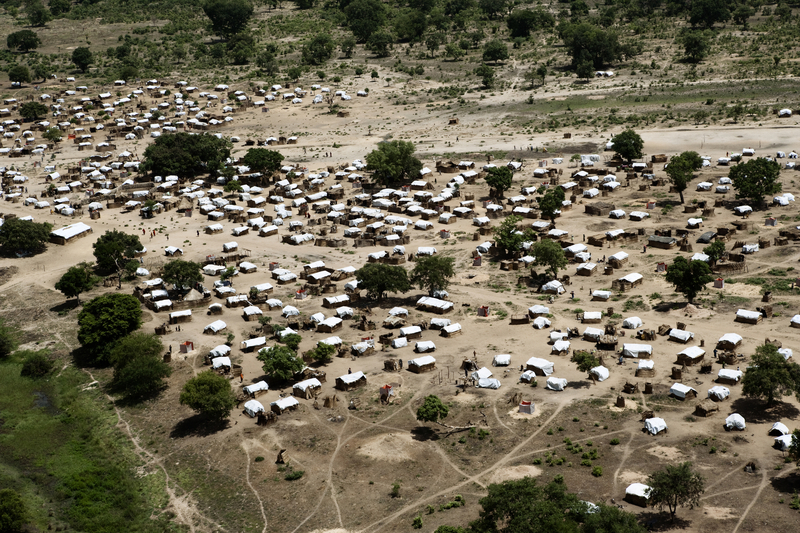 Twelve thousand of the refugees have settled in Daha (200 kilo metres from Chad’s border to CAR). Over 80 per cent of the refugees are women and children. The remoteness of these areas poses significant logistical challenges, particularly with regard to the rainy seasons. A Chadian villager protects himself with a blanket as he takes shelter under trees after an attack on his village forced him to flee to a site for internally displaced Chadians. Eastern Chad has seen extreme violence, in the form of attacks by paramilitary known as Janjaweed, while the area has been threatened by rebel groups fighting Chadian and Sudanese armies on Chadian territory. 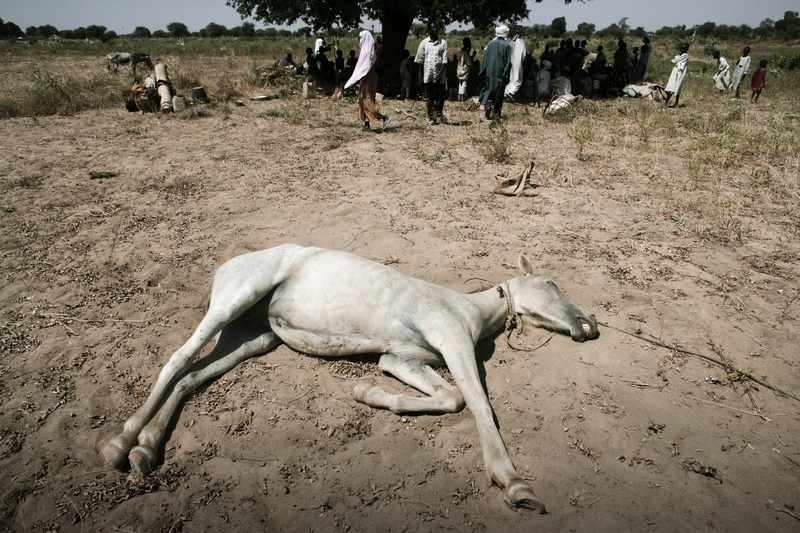 The UN refugee agency (UNHCR), issued reports of more than 200 people being killed by armed men on horseback in villages in the Dar Sila Department along the Chad-Sudan border just in the last two weeks. Thousands of Chadian villagers have fled their villages and become IDP (Internally Displaced People) and arriving in the area of Goz Beida often leaving the injured behind due to lack of transport. According to official sources IDP numbers in Chad are around 100,000 and most are not receiving any external assistance as they are not entitled to the refugee status set out by the United Nations. 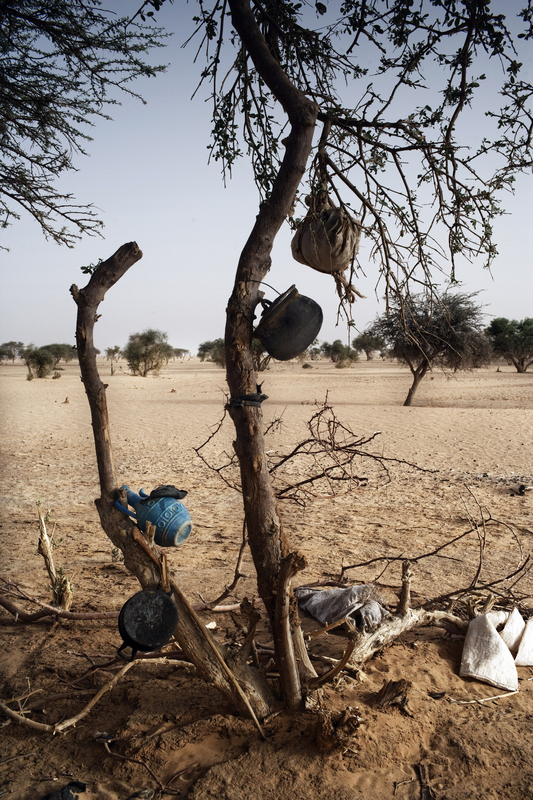 In a Chadian village people take refuge under trees after an attack on their village forced them to flee to a site for internally displaced people. Eastern Chad has seen extreme violence, in the form of attacks by paramilitary known as Janjaweed, while the area has been threatened by rebel groups fighting Chadian and Sudanese armies on Chadian territory. The UN refugee agency (UNHCR), issued reports of more than 200 people being killed by armed men on horseback in villages in the Dar Sila Department along the Chad-Sudan border just in the last two weeks. Thousands of Chadian villagers have fled their villages and become IDP (Internally Displaced People) and arriving in the area of Goz Beida often leaving the injured behind due to lack of transport. According to official sources IDP numbers in Chad are around 100,000 and most are not receiving any external assistance as they are not entitled to the refugee status set out by the United Nations. 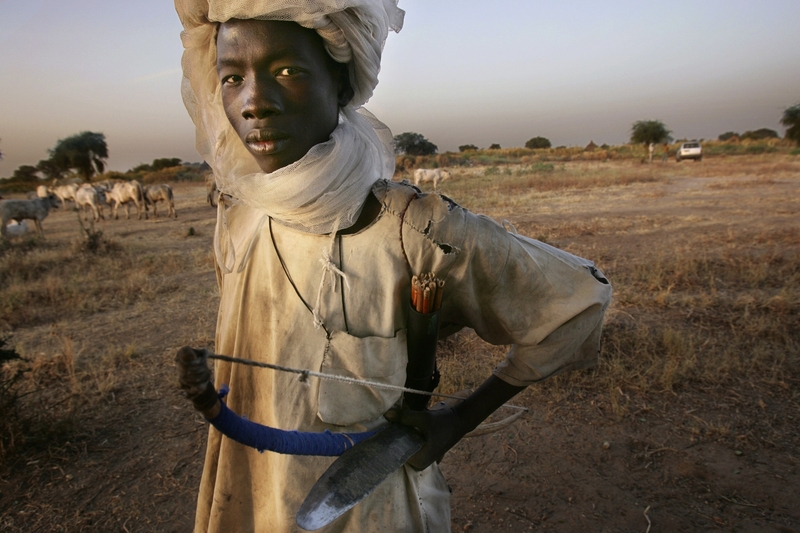 A Chadian Villager with a bow and arrow which he uses to defend his family from attacks. The family found refuge under trees in the forest after they fled an attack on their village. Eastern Chad has seen extreme violence, in the form of attacks by paramilitary known as Janjaweed, while the area has been threatened by rebel groups fighting Chadian and Sudanese armies on Chadian territory. The UN refugee agency (UNHCR), issued reports of more than 200 people being killed by armed men on horseback in villages in the Dar Sila Department along the Chad-Sudan border just in the last two weeks. Thousands of Chadian villagers have fled their villages and become IDP (Internally Displaced People) and arriving in the area of Goz Beida often leaving the injured behind due to lack of transport. According to official sources IDP numbers in Chad are around 100,000 and most are not receiving any external assistance as they are not entitled to the refugee status set out by the United Nations. 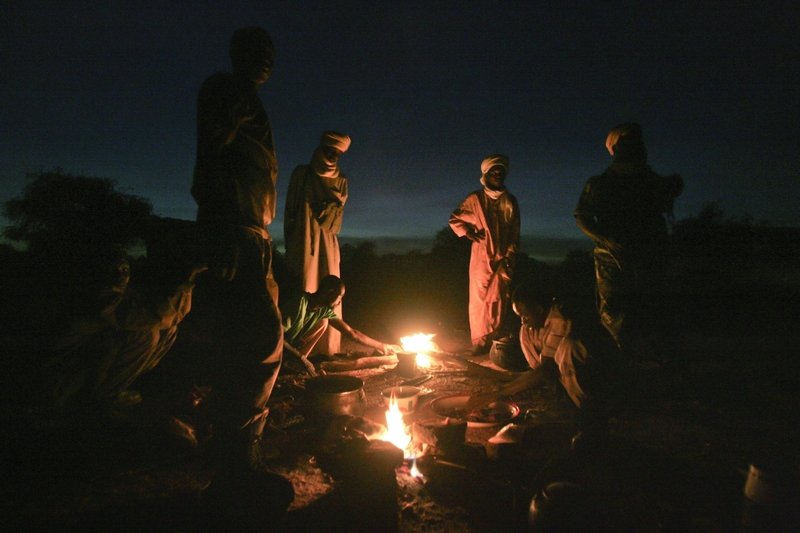 Chadian Army Soldiers cook dinner around an open air fire where they have been sent to protect village people and their children taking refuge under trees after an attack on their village forced them to flee to a camp for internally displaced people. Eastern Chad has seen extreme violence, in the form of attacks by paramilitary known as Janjaweed, while the area has been threatened by rebel groups fighting Chadian and Sudanese armies on Chadian territory. The UN refugee agency (UNHCR), issued reports of more than 200 people being killed by armed men on horseback in villages in the Dar Sila Department along the Chad-Sudan border just in the last two weeks. Thousands of Chadian villagers have fled their villages and become IDP (Internally Displaced People) and arriving in the area of Goz Beida often leaving the injured behind due to lack of transport. According to official sources IDP numbers in Chad are around 100,000 and most are not receiving any external assistance as they are not entitled to the refugee status set out by the United Nations. 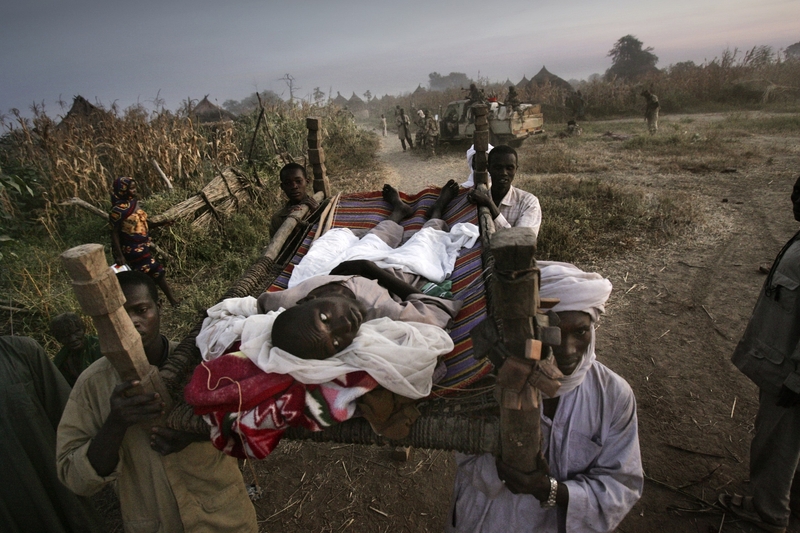 Chadian villagers carry a wounded man during a Chadian Army rescue mission in Bandikao Village, 90 Km south of Goz Beida. According to Human Rights Watch, in 2003 fighting broke out between ethnic Muro Africans and Arab nomads. They fought with homemade weapons of bow and arrows yet three years later the Arabs are flanked in khaki uniforms and using assault rifles, though it is unclear by whom they have been supplied arms. Five men were killed by arabs on November 4th, outside Bandikao village, which is part of a confederation of eight villages that has a self defense force. The people from the village pursued the attackers and were ambushed and massacred. As a result of the battle forty five people were killed and forty-one were wounded. The dead and injured were left behind due to lack of transport and due to the security situation howver the Chadian army ultimately decided to send a rescue team to evacuate the injured. Chadian Arm soldiers drive to Bandikao to conduct a rescue mission in Bandikao Village, 90 Km south of Goz Beida, Chad. According to Human Rights Watch, in 2003 fighting broke out between ethnic Muro Africans and Arab nomads. They fought with homemade weapons of bow and arrows yet three years later the Arabs are flanked in khaki uniforms and using assault rifles, though it is unclear by whom they have been supplied arms. Five men were killed by arabs on November 4th, outside Bandikao village, which is part of a confederation of eight villages that has a self defense force. The people from the village pursued the attackers and were ambushed and massacred. As a result of the battle forty five people were killed and forty-one were wounded. The dead and injured were left behind due to lack of transport and due to the security situation howver the Chadian army ultimately decided to send a rescue team to evacuate the injured. 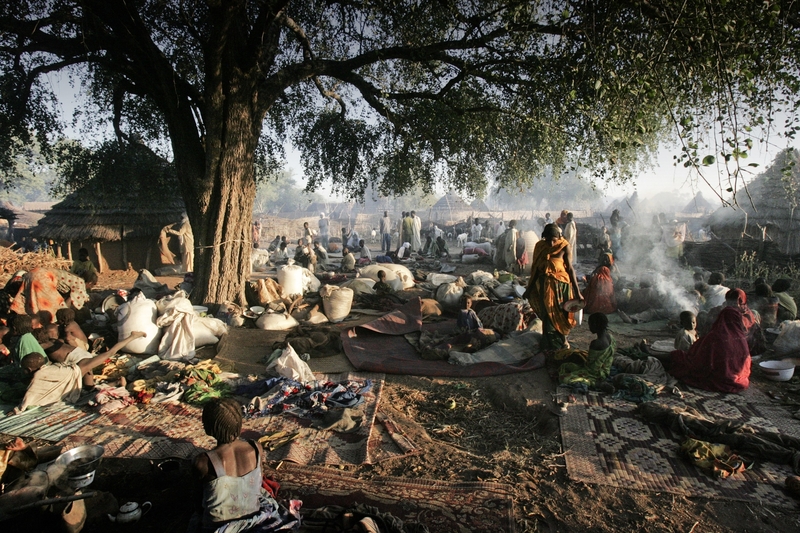 Newly arrived Sudanese refugees, who escaped bombing from the Sudanese air force in their villages in Darfur sit under trees as they wait for permission from the UNHCR (United Nation High Commission for Refugees) to settle inside the Oure Cassoni refugee camp. Since 2004 over 260,000 Sudanese refugees from Darfur have crossed into eastern Chad. They live in 12 camps along the border. Over 85 percent of them are women and children. The latest influx of refugees arrived after an attack on three villages in western Sudan in February 2008. Since April 2006 regular rebel attacks on Chadian villages in the border area of Darfur, have led to a spiral of escalating violence throughout eastern Chad. About 170,000 Chadians have been forced over the last three years to flee their villages, often leaving all their belongings behind. In January 2009 over 15,000 refugees from Central African Republic (CAR) have also entered south-eastern Chad, following clashes between Rounga rebels and the national army of CAR. A Chadian villager wounded in the recent fighting, on the ground of the hospital compound after an attack on her village forced her to flee. Eastern Chad has seen extreme violence, in the form of attacks by paramilitary known as Janjaweed, while the area has been threatened by rebel groups fighting Chadian and Sudanese armies on Chadian territory. The UN refugee agency (UNHCR), issued reports of more than 200 people being killed by armed men on horseback in villages in the Dar Sila Department along the Chad-Sudan border just in the last two weeks. Thousands of Chadian villagers have fled their villages and become IDP (Internally Displaced People) and arriving in the area of Goz Beida often leaving the injured behind due to lack of transport. According to official sources IDP numbers in Chad are around 100,000 and most are not receiving any external assistance as they are not entitled to the refugee status set out by the United Nations. 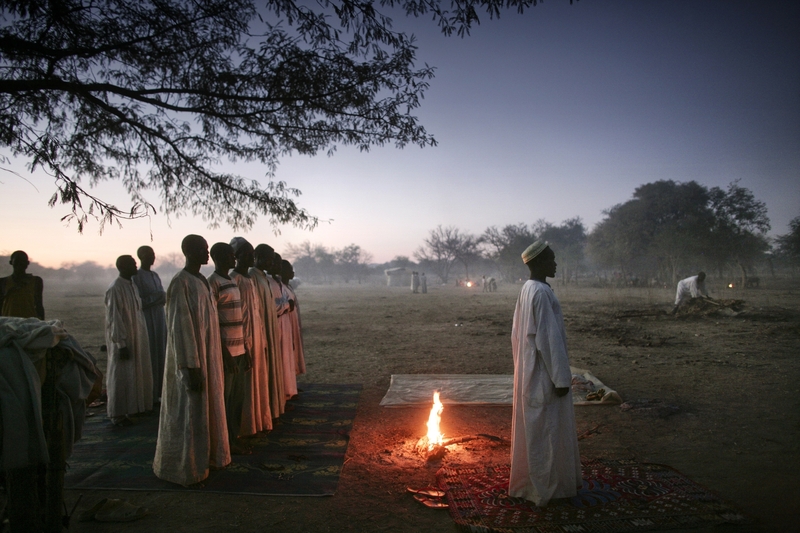 Chadian villagers pray while taking shelter under trees after an attack on their village forced them to flee to a site for internally displaced people. Eastern Chad has seen extreme violence, in the form of attacks by paramilitary known as Janjaweed, while the area has been threatened by rebel groups fighting Chadian and Sudanese armies on Chadian territory. The UN refugee agency (UNHCR), issued reports of more than 200 people being killed by armed men on horseback in villages in the Dar Sila Department along the Chad-Sudan border just in the last two weeks. Thousands of Chadian villagers have fled their villages and become IDP (Internally Displaced People) and arriving in the area of Goz Beida often leaving the injured behind due to lack of transport. According to official sources IDP numbers in Chad are around 100,000 and most are not receiving any external assistance as they are not entitled to the refugee status set out by the United Nations. 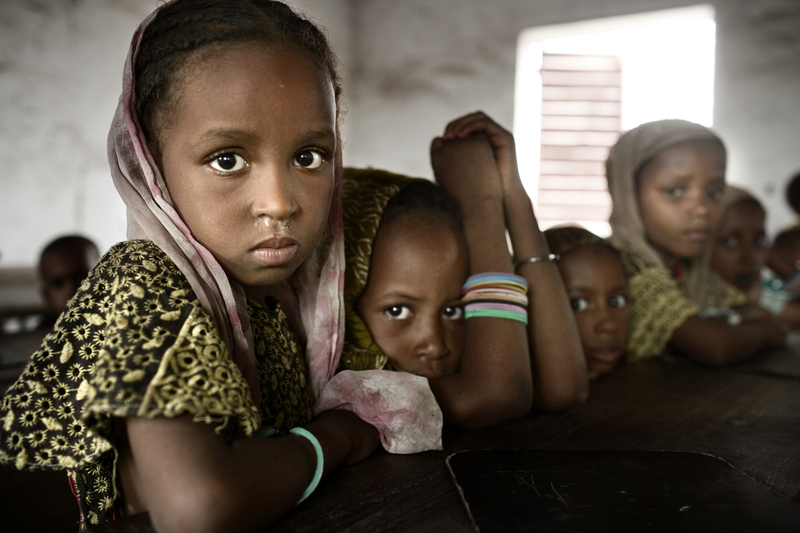 Nomadic school children in a UNICEF supported school during Ralph Fiennes visit to Guite, Chad. UNICEF UK Ambassador Ralph Fiennes travelled to Chad to witness firsthand the plight of women and children affected by the current humanitarian crisis. During his visit Mr. Fiennes travelled to Goz Beida (Eastern Chad bordering Sudan) and Daha (Southern Chad bordering Central African Republic) to meet with refugees who had been forced from their homes by the conflict in the Darfur region of Sudan as well as Chadian families who had fled violence within their own communities and newly arrived refugees from the Central African Republic. While in Chad, Mr. Fiennes saw the life saving work that UNICEF and its partners were doing to alleviate the suffering of children and their families who were living in camps in the Eastern and Southern regions of the country. In the capital N’Djamena, Mr. Fiennes met with former child soldiers and children who are being held in an adult detention centre. He also travelled to Guite, two hours from the capital to see the lives of nomadic families. This is the first time that Mr. Fiennes has travelled to Chad. Chadian villagers ride horses nearbye their shelter under trees after an attack on their village forced them to flee to a site for internally displaced people. Eastern Chad has seen extreme violence, in the form of attacks by paramilitary known as Janjaweed, while the area has been threatened by rebel groups fighting Chadian and Sudanese armies on Chadian territory. The UN refugee agency (UNHCR), issued reports of more than 200 people being killed by armed men on horseback in villages in the Dar Sila Department along the Chad-Sudan border just in the last two weeks. Thousands of Chadian villagers have fled their villages and become IDP (Internally Displaced People) and arriving in the area of Goz Beida often leaving the injured behind due to lack of transport. According to official sources IDP numbers in Chad are around 100,000 and most are not receiving any external assistance as they are not entitled to the refugee status set out by the United Nations. A Chadian villager washes her baby as she takes refuge under trees after an attack on their village forced them to flee to a site for internally displaced people. Eastern Chad has seen extreme violence, in the form of attacks by paramilitary known as Janjaweed, while the area has been threatened by rebel groups fighting Chadian and Sudanese armies on Chadian territory. The UN refugee agency (UNHCR), issued reports of more than 200 people being killed by armed men on horseback in villages in the Dar Sila Department along the Chad-Sudan border just in the last two weeks. Thousands of Chadian villagers have fled their villages and become IDP (Internally Displaced People) and arriving in the area of Goz Beida often leaving the injured behind due to lack of transport. According to official sources IDP numbers in Chad are around 100,000 and most are not receiving any external assistance as they are not entitled to the refugee status set out by the United Nations. 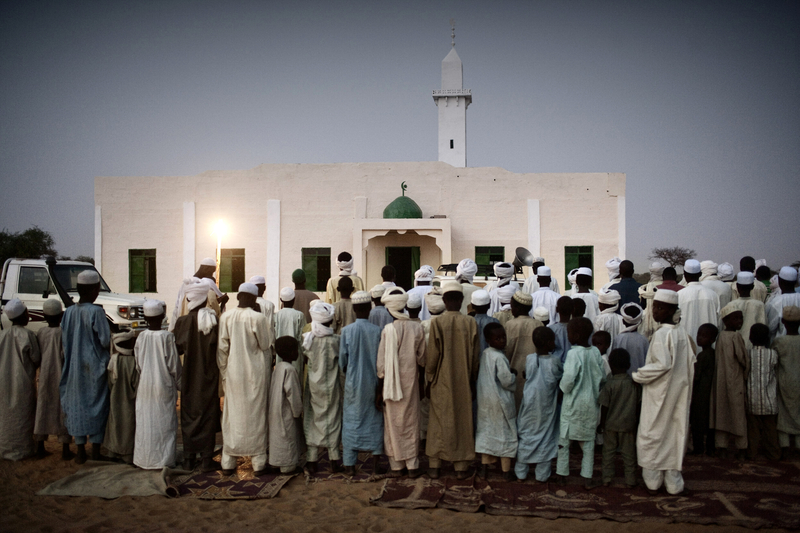 Local residents gather around the biggest mosque in the region for the evening prayer. Since 2004 over 260,000 Sudanese refugees from Darfur have crossed into eastern Chad. They live in 12 camps along the border. Over 85 percent of them are women and children. 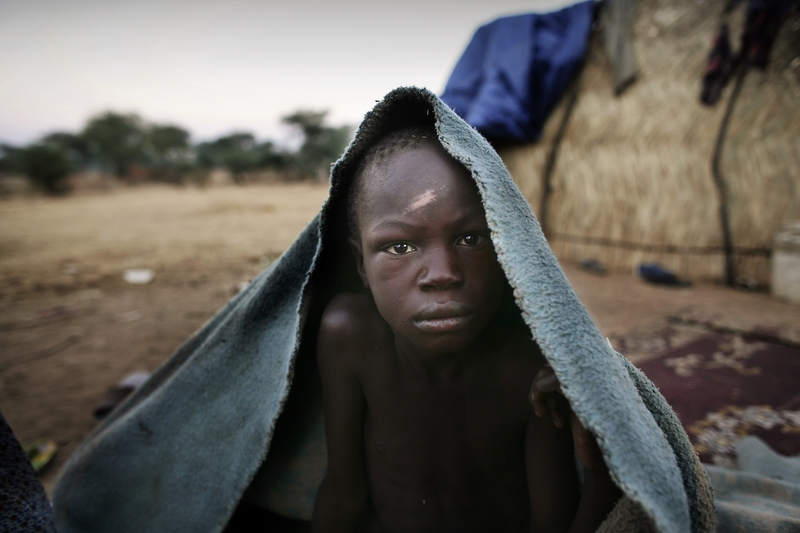 The latest influx of refugees arrived after an attack on three villages in western Sudan in February 2008. 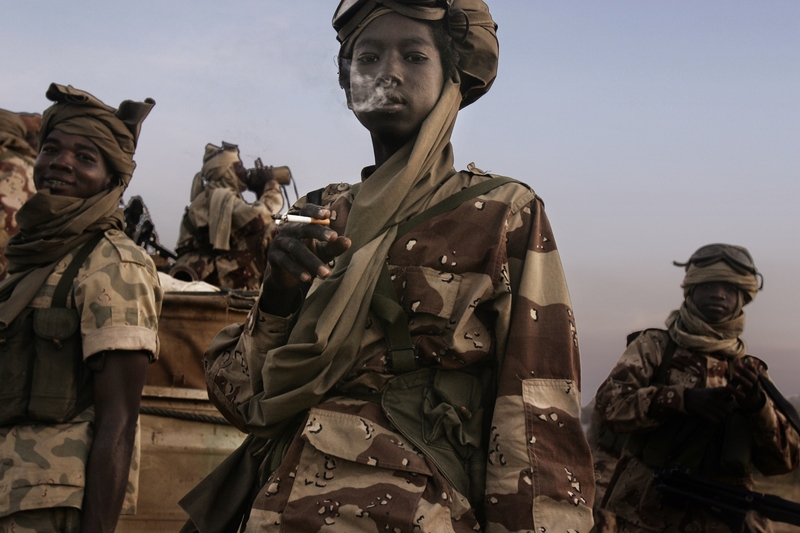 Since April 2006 regular rebel attacks on Chadian villages in the border area of Darfur, have led to a spiral of escalating violence throughout eastern Chad. About 170,000 Chadians have been forced over the last three years to flee their villages, often leaving all their belongings behind. In January 2009 over 15,000 refugees from Central African Republic (CAR) have also entered south-eastern Chad, following clashes between Rounga rebels and the national army of CAR. A relative of a man wounded in the recent fighting on the ground of the Hospital compound after an attack on his village forced him to flee. Eastern Chad has seen extreme violence, in the form of attacks by paramilitary known as Janjaweed, while the area has been threatened by rebel groups fighting Chadian and Sudanese armies on Chadian territory. The UN refugee agency (UNHCR), issued reports of more than 200 people being killed by armed men on horseback in villages in the Dar Sila Department along the Chad-Sudan border just in the last two weeks. Thousands of Chadian villagers have fled their villages and become IDP (Internally Displaced People) and arriving in the area of Goz Beida often leaving the injured behind due to lack of transport. According to official sources IDP numbers in Chad are around 100,000 and most are not receiving any external assistance as they are not entitled to the refugee status set out by the United Nations. Rebels from the NRF wounded in the recent fighting playing cards as they recover in their hospital roo. Sudanese Army soldiers and NRF (National Redemption Front) rebels are recovering together in beds next to each other in the Bahai Hospital in Chad after fighting in Darfur. The Sudanese Army soldiers are recovering under the supervision of the ICRC (International Commite of the Red Cross) and will be sent back home once are healed. 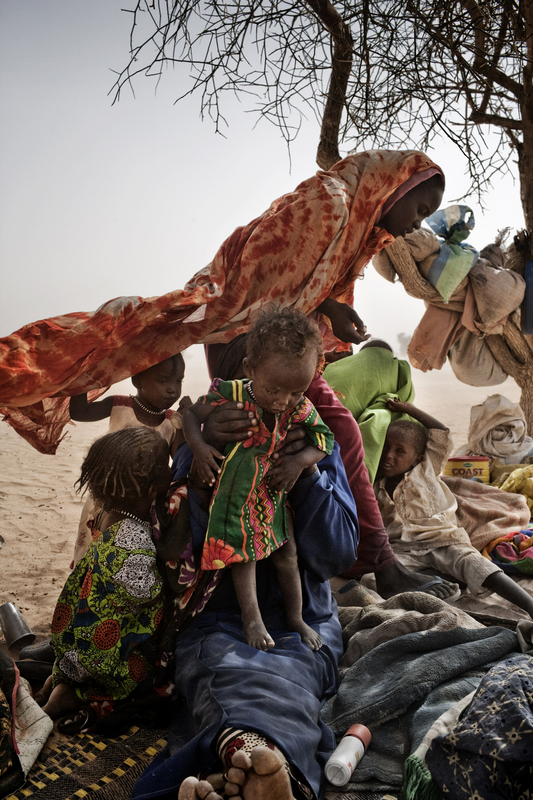 A sick Chadian villager takes shelter under trees with her family after an attack on their village forced them to flee to a site for internally displaced people. Eastern Chad has seen extreme violence, in the form of attacks by paramilitary known as Janjaweed, while the area has been threatened by rebel groups fighting Chadian and Sudanese armies on Chadian territory. The UN refugee agency (UNHCR), issued reports of more than 200 people being killed by armed men on horseback in villages in the Dar Sila Department along the Chad-Sudan border just in the last two weeks. Thousands of Chadian villagers have fled their villages and become IDP (Internally Displaced People) and arriving in the area of Goz Beida often leaving the injured behind due to lack of transport. According to official sources IDP numbers in Chad are around 100,000 and most are not receiving any external assistance as they are not entitled to the refugee status set out by the United Nations. Newly arrived Sudanese refugees, who escaped bombing from the Sudanese air force in their villages in Darfur, sit under trees as they wait for permission from the UNHCR (United Nation High Commission for Refugees) to settle inside the refugee camp. 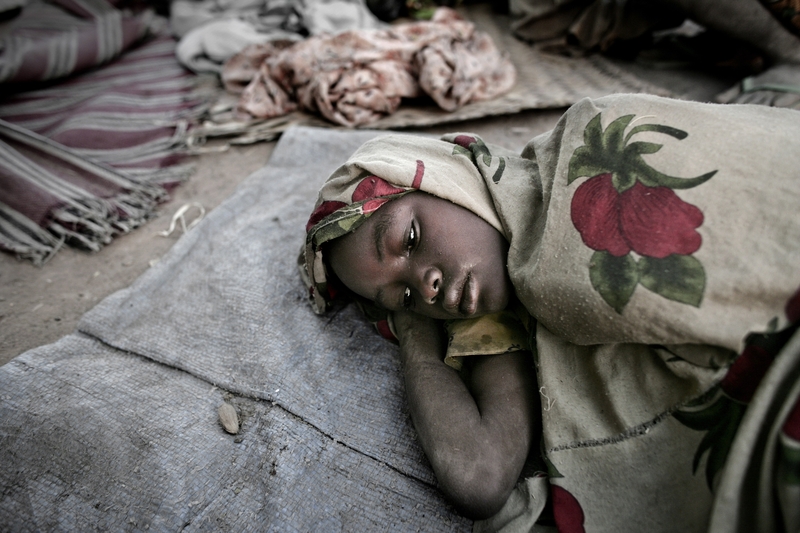 Since 2004 over 260,000 Sudanese refugees from Darfur have crossed into eastern Chad. They live in 12 camps along the border. Over 85 percent of them are women and children. 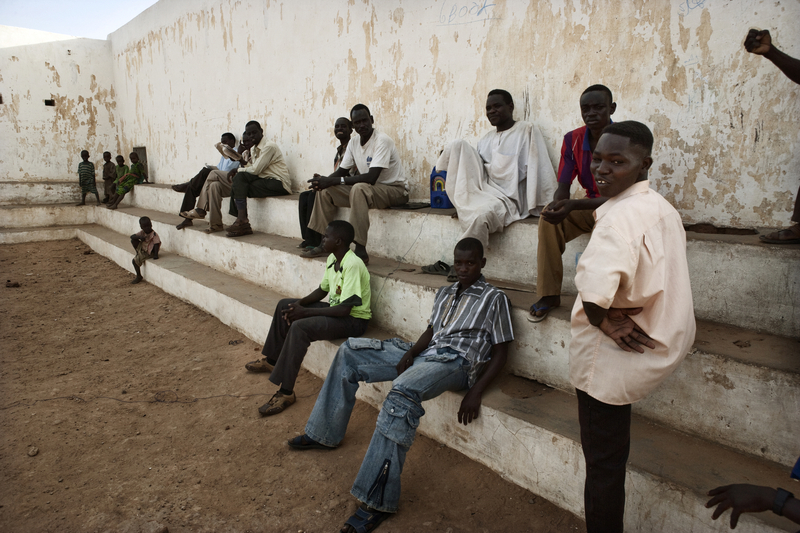 The latest influx of refugees arrived after an attack on three villages in western Sudan in February 2008. Since April 2006 regular rebel attacks on Chadian villages in the border area of Darfur, have led to a spiral of escalating violence throughout eastern Chad. About 170,000 Chadians have been forced over the last three years to flee their villages, often leaving all their belongings behind. In January 2009 over 15,000 refugees from Central African Republic (CAR) have also entered south-eastern Chad, following clashes between Rounga rebels and the national army of CAR. The belongings of newly arrived Sudanese refugees, who escaped bombings from the Sudanese air force in their villages in Darfur, wait for permission from the UNHCR (United Nation High Commission for Refugees) to settle inside the Oure Cassoni refugee camp. 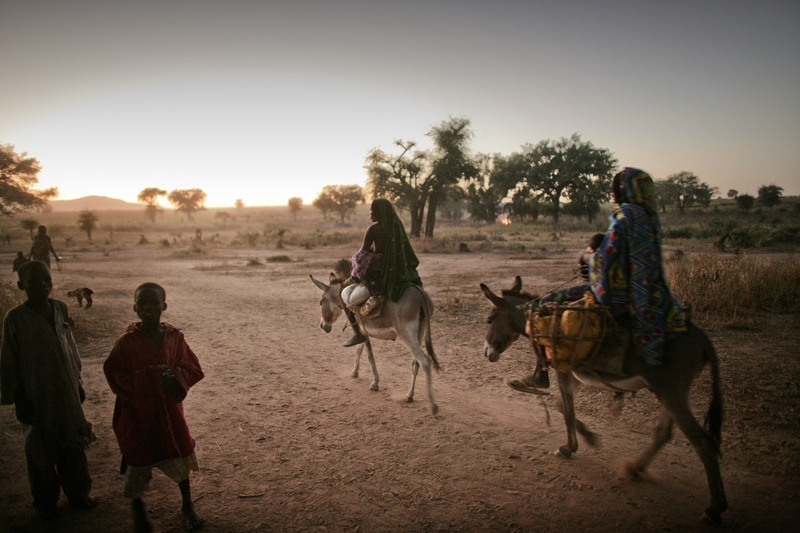 Since 2004 over 260,000 Sudanese refugees from Darfur crossed into eastern Chad. They live in 12 camps along the border. Over 85 per cent of them are women and children. The latest influx of refugees arrived after an attack on three villages in western Sudan in February 2008. Since April 2006 regular rebel attacks Since 2004 over 260,000 Sudanese refugees from Darfur have crossed into eastern Chad. They live in 12 camps along the border. Over 85 percent of them are women and children. The latest influx of refugees arrived after an attack on three villages in western Sudan in February 2008. 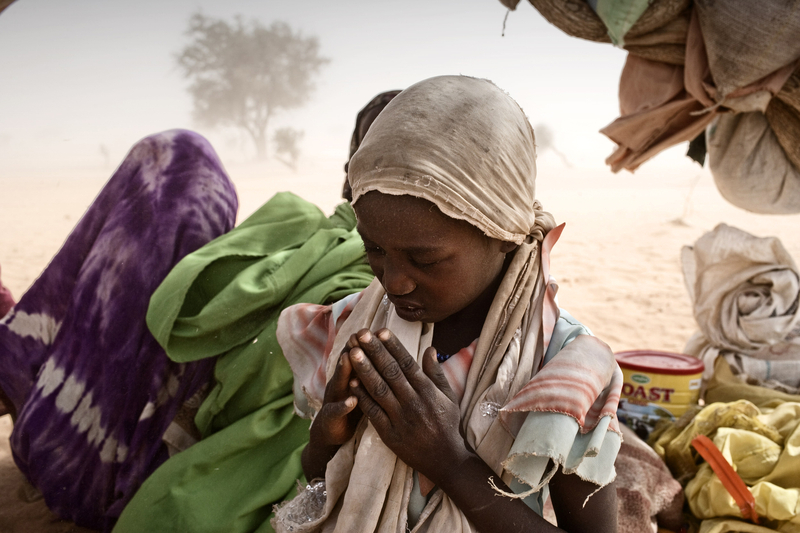 Since April 2006 regular rebel attacks on Chadian villages in the border area of Darfur, have led to a spiral of escalating violence throughout eastern Chad. About 170,000 Chadians have been forced over the last three years to flee their villages, often leaving all their belongings behind. In January 2009 over 15,000 refugees from Central African Republic (CAR) have also entered south-eastern Chad, following clashes between Rounga rebels and the national army of CAR. Refugees are seen at a center for juveniles in Daha refugee camp. Since January 2009, thousands of refugees have entered south-eastern Chad, following clashes between Rounga rebels and armed forces of the Government of the Central African Republic (CAR). The majority of them are staying in two sites close to Daha (800 km south of Abeche or 1 km from the CAR/Chad border) of which is accommodating over 11,000 refugees. An average of 120 new refugees arrives every day. Many of them had to leave all their belongings behind, possessing only the little that they could carry on their backs, when crossing the border after several days of walking through the bush. Prior to the refugee influx the area of Daha counted about 4,000 inhabitants. The host community has shared their belongings with the new-comers, until their already scarce resources ran out. The sudden influx of people has meant a sharp increase in food prices in the local market. A 500 kg of millet that used to cost 400 CFA (local money) has doubled in price to 800 CFA (US$1.50). UNICEF has set up a temporary base in Daha and is providing lifesaving support to refugees, by making sure that children and their families have safe drinking water, adequate sanitation facilities, emergency health care as well as ensuring that children are able to carry on with their schooling. Since 2004 over 260,000 Sudanese refugees from Darfur have crossed into eastern Chad. They live in 12 camps along the border. Over 85 percent of them are women and children. The latest influx of refugees arrived after an attack on three villages in western Sudan in February 2008. Since April 2006 regular rebel attacks on Chadian villages in the border area of Darfur, have led to a spiral of escalating violence throughout eastern Chad. About 170,000 Chadians have been forced over the last three years to flee their villages, often leaving all their belongings behind. In January 2009 over 15,000 refugees from Central African Republic (CAR) have also entered south-eastern Chad, following clashes between Rounga rebels and the national army of CAR. 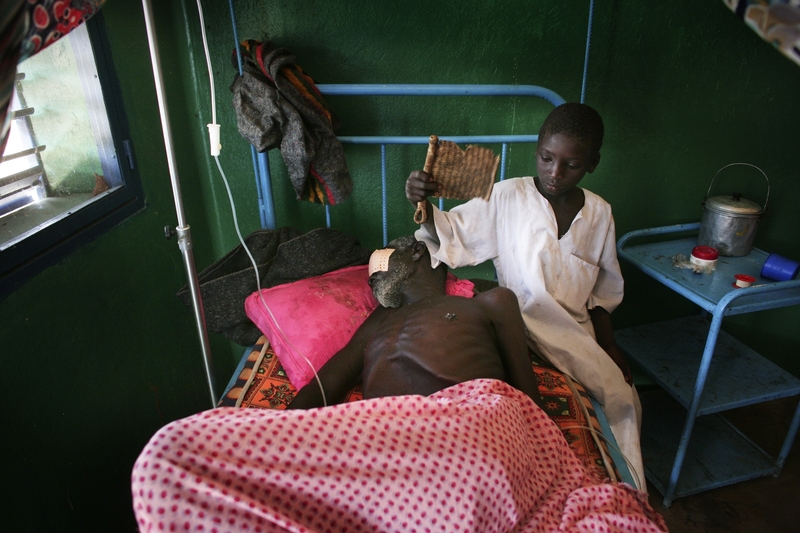 A Chadian villager recovers in his hospital bed from a gun shot wound, suffered in the recent fighting between ethnic Arabs and ethnic Africans after an attack on his village forced him to flee. Eastern Chad has seen extreme violence, in the form of attacks by paramilitary known as Janjaweed, while the area has been threatened by rebel groups fighting Chadian and Sudanese armies on Chadian territory. The UN refugee agency (UNHCR), issued reports of more than 200 people being killed by armed men on horseback in villages in the Dar Sila Department along the Chad-Sudan border just in the last two weeks. Thousands of Chadian villagers have fled their villages and become IDP (Internally Displaced People) and arriving in the area of Goz Beida often leaving the injured behind due to lack of transport. According to official sources IDP numbers in Chad are around 100,000 and most are not receiving any external assistance as they are not entitled to the refugee status set out by the United Nations. 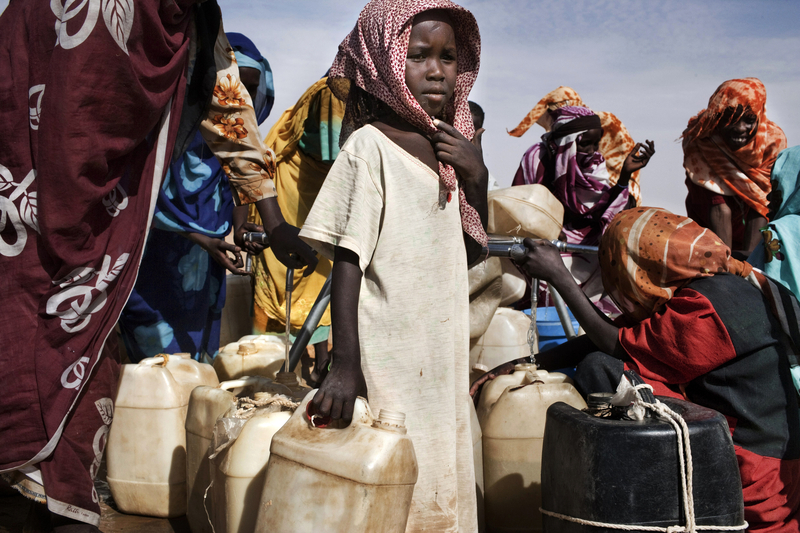 Sudanese refugees collect water at a water pump in Oure Cassoni refugee camp. Since 2004 over 260,000 Sudanese refugees from Darfur have crossed into eastern Chad. They live in 12 camps along the border. Over 85 percent of them are women and children. The latest influx of refugees arrived after an attack on three villages in western Sudan in February 2008. Since April 2006 regular rebel attacks on Chadian villages in the border area of Darfur, have led to a spiral of escalating violence throughout eastern Chad. About 170,000 Chadians have been forced over the last three years to flee their villages, often leaving all their belongings behind. In January 2009 over 15,000 refugees from Central African Republic (CAR) have also entered south-eastern Chad, following clashes between Rounga rebels and the national army of CAR. 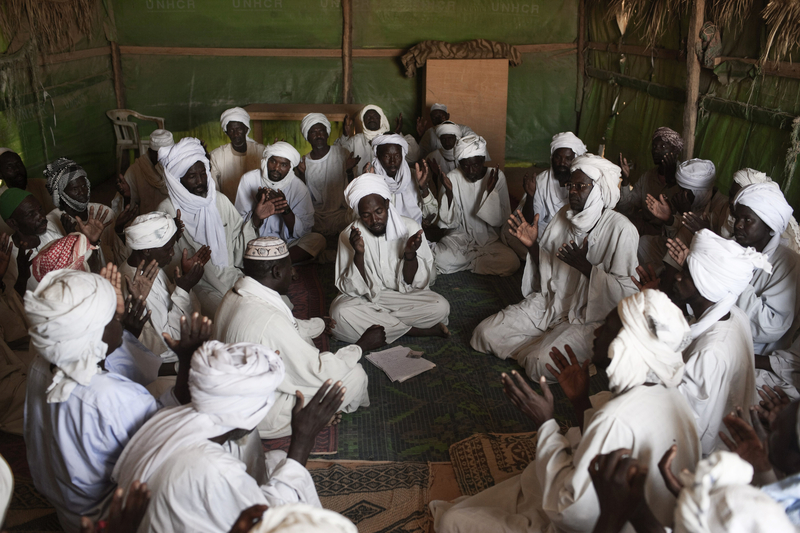 Sudanese refugees pray at the end of a wedding in Oure Cassoni refugee camp. Since 2004 over 260,000 Sudanese refugees from Darfur have crossed into eastern Chad. They live in 12 camps along the border. Over 85 percent of them are women and children. The latest influx of refugees arrived after an attack on three villages in western Sudan in February 2008. 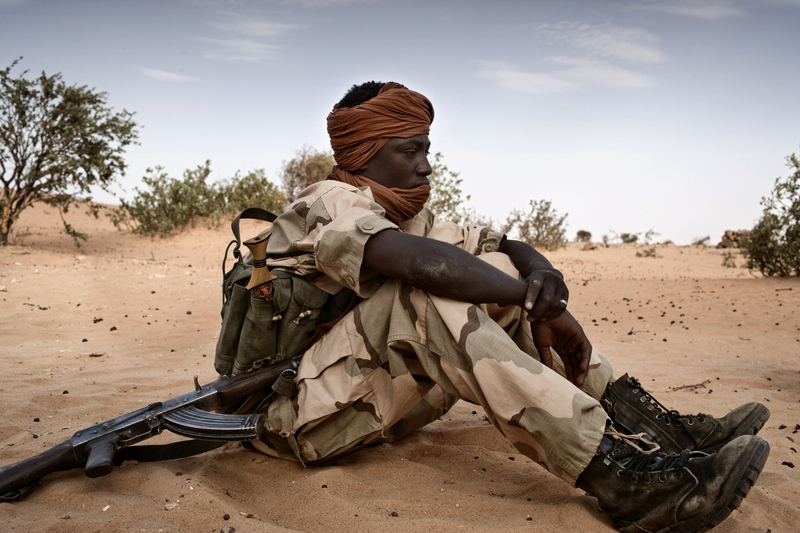 Since April 2006 regular rebel attacks on Chadian villages in the border area of Darfur, have led to a spiral of escalating violence throughout eastern Chad. About 170,000 Chadians have been forced over the last three years to flee their villages, often leaving all their belongings behind. In January 2009 over 15,000 refugees from Central African Republic (CAR) have also entered south-eastern Chad, following clashes between Rounga rebels and the national army of CAR. Sudanese and internally displaced Chadian mothers with their children who are suffering from malnutrition recover in the Goz Beida Hospital. With 200 deaths per 1,000 live births Chad is amongst the ten countries in the world with the highest infant mortality rates. Maternal mortality was estimated at 1,099 deaths per 100,000 live births in 2004. Main causes for morbidity and mortality of children under five years old are malaria, respiratory infections and diarrhoea. In combination with acute malnutrition, lack of access to clean water and overpopulation in the camps, children have a deadly setting for their most vulnerable stage of life. Based in Djabal camp in Eastern Chad, Goz Beida Hospital serves a community of 60,000 internally displaced people and 18,000 refugees from Sudan. The hospital provides therapeutic feeding to children who are severely malnourished. The high levels of child malnutrition in eastern Chad are partly due to food insecurity, but also the lack of nutritional knowledge amongst mothers, leading to bad feeding practices. They are treated with a highly nutritional milk until they reach an acceptable weight. Since 2004 over 260,000 Sudanese refugees from Darfur have crossed into eastern Chad. They live in 12 camps along the border. Over 85 percent of them are women and children. The latest influx of refugees arrived after an attack on three villages in western Sudan in February 2008. 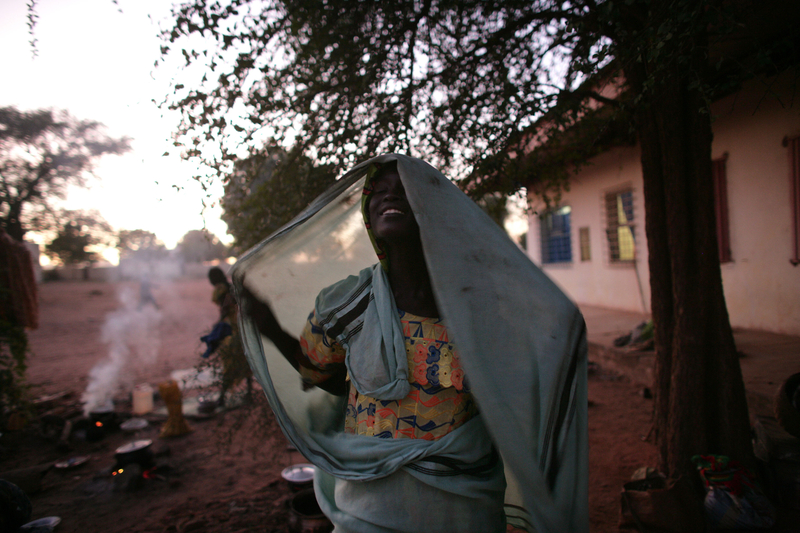 Since April 2006 regular rebel attacks on Chadian villages in the border area of Darfur, have led to a spiral of escalating violence throughout eastern Chad. About 170,000 Chadians have been forced over the last three years to flee their villages, often leaving all their belongings behind. In January 2009 over 15,000 refugees from Central African Republic (CAR) have also entered south-eastern Chad, following clashes between Rounga rebels and the national army of CAR. Chadian villagers organized themselves as a self defense force, carry bow and arrows. Eastern Chad has seen extreme violence, in the form of attacks by paramilitary known as Janjaweed, while the area has been threatened by rebel groups fighting Chadian and Sudanese armies on Chadian territory. The UN refugee agency (UNHCR), issued reports of more than 200 people being killed by armed men on horseback in villages in the Dar Sila Department along the Chad-Sudan border just in the last two weeks. Thousands of Chadian villagers have fled their villages and become IDP (Internally Displaced People) and arriving in the area of Goz Beida often leaving the injured behind due to lack of transport. According to official sources IDP numbers in Chad are around 100,000 and most are not receiving any external assistance as they are not entitled to the refugee status set out by the United Nations. A general view from the air of the Daha refugee camp. 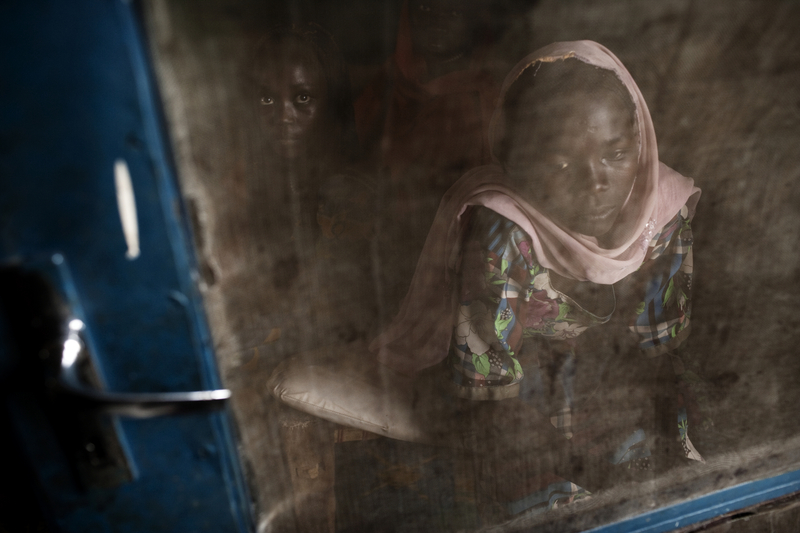 Since January 2009, thousands of refugees have entered south-eastern Chad, following clashes between Rounga rebels and armed forces of the Government of the Central African Republic (CAR). The majority of them are staying in two sites close to Daha (800 km south of Abeche or 1 km from the CAR/Chad border) of which is accommodating over 11,000 refugees. An average of 120 new refugees arrives every day. Many of them had to leave all their belongings behind, possessing only the little that they could carry on their backs, when crossing the border after several days of walking through the bush. Prior to the refugee influx the area of Daha counted about 4,000 inhabitants. The host community has shared their belongings with the new-comers, until their already scarce resources ran out. The sudden influx of people has meant a sharp increase in food prices in the local market. A 500 kg of millet that used to cost 400 CFA (local money) has doubled in price to 800 CFA (US$1.50). UNICEF has set up a temporary base in Daha and is providing lifesaving support to refugees, by making sure that children and their families have safe drinking water, adequate sanitation facilities, emergency health care as well as ensuring that children are able to carry on with their schooling. Since 2004 over 260,000 Sudanese refugees from Darfur have crossed into eastern Chad. They live in 12 camps along the border. Over 85 percent of them are women and children. The latest influx of refugees arrived after an attack on three villages in western Sudan in February 2008. Since April 2006 regular rebel attacks on Chadian villages in the border area of Darfur, have led to a spiral of escalating violence throughout eastern Chad. About 170,000 Chadians have been forced over the last three years to flee their villages, often leaving all their belongings behind. In January 2009 over 15,000 refugees from Central African Republic (CAR) have also entered south-eastern Chad, following clashes between Rounga rebels and the national army of CAR. A Member of the JEM (Justice and Equality Movement) rebels rests under a tree after crossing the border from Sudan near the Oure Cassoni refugee camp. Since 2004 over 260,000 Sudanese refugees from Darfur have crossed into eastern Chad. They live in 12 camps along the border. Over 85 percent of them are women and children. The latest influx of refugees arrived after an attack on three villages in western Sudan in February 2008. Since April 2006 regular rebel attacks on Chadian villages in the border area of Darfur, have led to a spiral of escalating violence throughout eastern Chad. About 170,000 Chadians have been forced over the last three years to flee their villages, often leaving all their belongings behind. In January 2009 over 15,000 refugees from Central African Republic (CAR) have also entered south-eastern Chad, following clashes between Rounga rebels and the national army of CAR.